Business freshman Anthony Matthews repairs an iPhone in his dorm Tuesday. Matthews began his iPhone repair business, iGoRepair, in the fall of 2012. 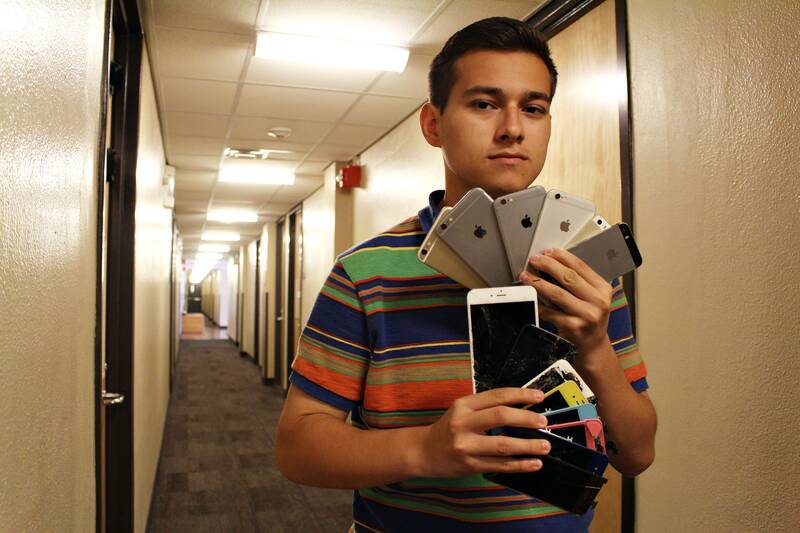 After local repair shops wanted to charge him $120 to fix his cracked iPhone screen, business freshman Anthony Matthews decided to take matters into his own hands. Using online research, Matthews taught himself how to repair his phone screen. In the fall of 2012, Matthews posted his finished product on social media and soon after, started his iPhone repair service. Since launching his business, “iGoRepair,” Matthews has repaired iPhone and iPad screens, batteries and buttons and has repaired 637 devices. Matthews has relocated his service from his hometown in Abilene to Austin, running the business out of his dorm in Jester. To differentiate himself from other services, Matthews meets with customers to repair devices in person anywhere on campus in 30 minutes or less. Social media plays a key role in driving “iGoRepair” forward, Matthews said. Biology freshman Abby Mohr said she feels the best feature of “iGoRepair” is its convenience. Matthews said connecting with his peers is the most rewarding part of doing business.